A young boy carries a heavy basket laden with cocoa seeds in a remote farming commune in Côte d'Ivoire. For a decade and a half, the big chocolate makers have promised to end child labor in their industry — and have spent tens of millions of dollars in the effort. But as of the latest estimate, 2.1 million West African children still do the dangerous and physically taxing work of harvesting cocoa. What will it take to fix the problem? 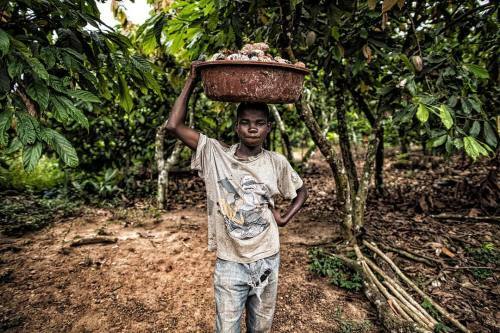 #photojournalism #documentary #reportage #cocoa #cotedivoire #chocolate #childlabor" By benlowy on Instagram.